Ever had your heart skip a beat? A cardiac MRI may be in your future. Many of us had had the experience of our heart skipping a beat making you feel anxious or stressed. This is something many people will brush off as a fluke incident as soon as it passes. However, this is not always a feeling that we should ignore as it could potentially be a symptom of a heart arrhythmia. What is a heart arrhythmia? An arrhythmia is an irregular or abnormal heart beat. The heart relies on electrical impulses to keep it beating at a steady pace and when these impulses change, the heart can beat abnormally. The result of an abnormal heart beat is that the heart is no longer pumping blood effectively, which can pose its own set of risks. When these unusual heart symptoms are displayed, there are some common types of imaging that your cardiologist may request: an EKG, a chest x-ray, or an echocardiogram. All of these allow your doctor to evaluate the functioning of the heart and associated valves/arteries. One diagnosis technique that is gaining more popularity is for the cardiologist to order a subsequent cardiac MRI after initial imaging. The benefits of cardiac MRI for arrhythmia diagnosis. Cardiac MRI is a non-invasive and non-radiating imaging modality with unique soft tissue resolution capabilities that provides insight into multiple facets of the heart. Because of MRIs ability to produce extremely detailed pictures of your body’s muscle and differentiate between tissue, it is not surprising that it is rapidly developing a strong role in diagnostic cardiovascular diseases. When it comes to diagnosis arrhythmia, a cardiac MRI will paint an image of exactly how the vales are functioning, as well as evaluate the blood flow through major vessels. Using cross-sectional imaging of the body along multiple planes (like slices of bread), the clarity of an MRI scan’s image is far greater than conventional scans like a CT, ultrasound or x-ray. Additionally, there is no radiation in an MRI, making it very safe. Very likely a special contrast agent called gadolinium will be used to help visualize structures more effectively. A cardiac MRI can detect abnormalities that may have otherwise have been obscured. What is my cardiologist looking for in a cardiac MRI? Often known as the most deadly form of arrhythmia – this arrhythmia originates in the electrical pathways of the hearts ventricles. Ventricular arrhythmia includes ventricular tachycardia and ventricular fibrillation. These can often lead to coronary artery disease, hear attack, or weakened heart muscles. This is a fast or elevated heart rate that specifically starts in the atria or atrioventricular node. This encompasses several other forms of arrhythmia such as atrial fibrillation, atrial flutter, paroxysmal supraventricular tachycardia, or Wolff-Parkingson-White syndrome. This is a condition in which the patient’s heart rate is lower than the average 60 beats per minute for an adult. Bradycardia is often seen in very physically fit people, and is therefore not a cause for concern in those instances. However, in some instance such as those who have had a previous heart attack, or for those with underactive thyroids will likely need medical treatment for the condition. This is an irregular heart rhythm where the heart skips a beat, or includes extra beats. This is again, a non-threatening form of arrhythmia and happens naturally in most people. This can also be a result of stress, exercise, or too much caffeine. By utilizing cardiac MRI, your cardiologist will be able to come up with the proper treatment plan for your condition. This may include medication, catheter ablation, or straight forward lifestyle changes such as reduced caffeine or tobacco consumption. Why didn’t my cardiologist order a cardiac MRI for my arrhythmia? Cardiac MRI is certainly growing in popularity, however, it is still not as common as the “first line of defense” imaging modalities that will typically be recommended first. Often times the heart condition and arrhythmia will be identified using these techniques and an MRI will only be necessary if your cardiologist is looking for more information that they are not able to provide. Additionally, older MRI technology was limited by the constraints of respiratory and cardiac motion (ie: breathing in and out) during an MRI exam, making it difficult to get a clear imaging. As MRI technology advances, these are no longer limitations; improved, newer MRI machines have led to the very effective utilization of cardiac MRI. Shields offers the very latest in cardiac MRI technology on our high-field 1.5T and 3T MRI machines. Shields is a leader in cardiac MRI and the number of exams we’ve performed has doubled over the past year as this modality gains popularity in diagnoses for cardiac disease, including arrhythmias. 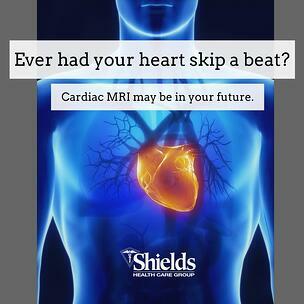 At Shields, every cardiac MRI is individualized to the patient’s disease and condition. On average, the scan takes about an hour and insurance authorization is typically required prior to the scan. Shields performs cardiac MRI on our high-field 1.5T & 3T and open-bore scanners at the following locations: Hyannis and Worcester (2 locations).